Now obviously Obama didn’t come up with this design himself; for starters, he’s neither clever nor creative enough to do so. 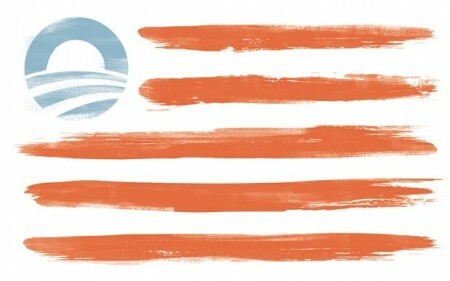 But the people who did design the flag obviously know their target audience: Obama himself. Voters? Secondary, at most. When your customer is as narcissistic as Obama, it probably isn’t hard to sell any idea to him if flattery is central to the concept. I’ve been trying to think of any figure in American political history who has had such an unearned sense of extreme self-regard. Can’t do it. I have to go all the way back to the Roman Empire to come up with an apt comparison. The emperors, you recall, were treated as gods in the Roman pantheon… but only a few — generally thought to be the crazy ones — actually believed it themselves. Given his propensity for trying to accomplish things by Imperial Decree Executive Order rather than the Constitutional (legislative) process, as well as the time he spends fiddling on Letterman (etc.) while the economy burns, I kind of suspect that Obama’s term in office will be remembered as the Imperial Presidency.